Note: CTRL F will allow you to search for words. 1. We subscribe only to health experts we believe a good teachers. 2. We then search on each of their channels for the topic below, then add their videos to the playlist below. Therefore, we have a playlist of videos from the best of the best teachers. Walking, Gait, How to Walk? Weight, How to Weigh Yourself? When you bring me home from my 2 doctor appointments in Ft Wayne today I am going to watch and hope to learn some topics I need to think about. I hope you are doing well Ma Graham...stay warm! Many blessings to you and your family this holiday season. Thank you. Same to you Karla. 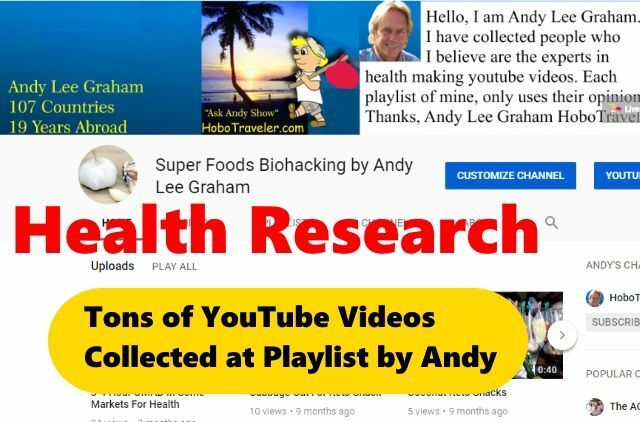 Andy, those were really good links, thanks, it is nice to use another persons brain as a filter instead of Google. You found some gems. The Apple cider thing is real, I read a farmer study where animals (cows) fed ACV had a conversion dietary improvement of about 20 percent by adding ACV. Same food, ate less, gained same amount of weight. I believe we need to use food as our medicine. However, Doctors learn to treat symptoms, not the causes, and food causes the problems. To stop the sugar addicts on the planet, about 95 percent of population is like being a Christian preacher talking at an Muslim Mosque, they cannot believe what they love is wrong.